Here’s a round up of all the alcoholic beverages that I could find (and please comment below if I left something out!) that are made on Maui. 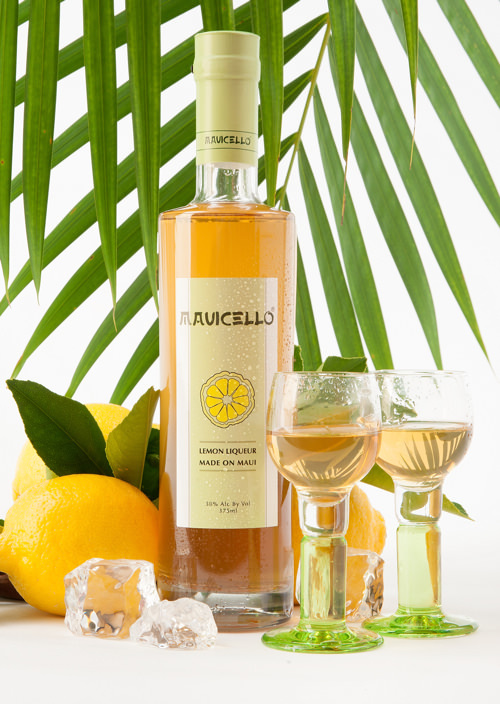 Mauicello – Mauicello is Maui’s very own lemon liqueur made exclusively with lemons and sugar grown right here on Maui. Although inspired by and similar to Italy’s traditional liqueur, limoncello, Mauicello’s rich golden color and distinctive taste make it a uniquely Maui product. Available at several retailers around Maui, and on Oahu at the Whole Foods locations. Pau Maui Vodka– Handcrafted in small batches by Haliimaile Distilling Company, ultra-premium Pau Maui vodka is distilled from Hawaiian Pineapples, yet there is no hint of pineapple flavor in the finished product. 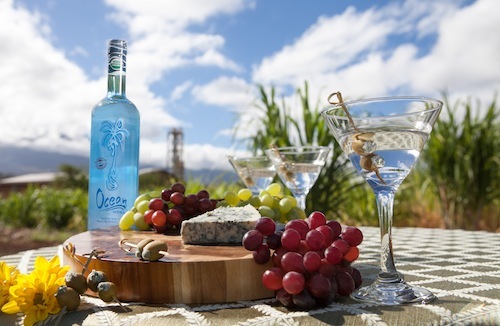 Once distilled, it is mixed with crystal clear Hawaiian spring water. Every ingredient that goes into the vodka is born on the islands, and the utmost in care is taken to ensure purity at every stage of the process. Maui Brewing- This multi-award winning brand includes a brewery offering tours, a popular brewpub, and an extensive line of flagship and limited edition brews. Yet another brewpub and brewery is currently under construction. Maui Brewing Beers can be found in Maui’s best restaurants, in almost every grocery or convenience store, around the island chain, and around the country, or sent to your door from their retailers. 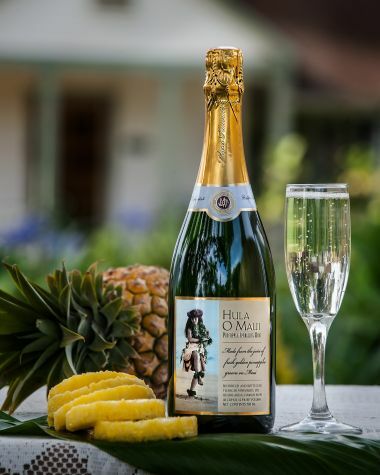 Maui’s Winery/ Tedeschi Vineyards – Maui’s Winery, the Valley Isle’s sole commercial winery, is known for their varied selection of wines including sparkling, pineapple, grape and a delicious raspberry dessert wine. Located at the scenic and historic Ulupalakua Ranch, they offer wine tasting throughout the day, and tours twice daily (check website for more info). They can also ship your order to most states. Old Lahaina Rum– Built the distillery inside a 100 year old building on the site of a former sugar mill on Maui’s North Shore. The silver, gold and dark rums are made with Maui grown sugar cane and molasses hand blended from mixed aged rum stocks. Currently only available in Hawaii. Recently spotted at Maui’s Costco. 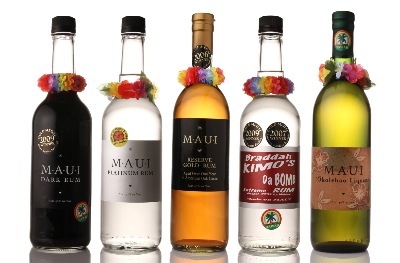 Haleakala Distillers – Creaters of Maui Dark Rum, Maui Gold Rum, Braddah Kimo’s Da Bomb Rum, (77.5% alcohol by volume), Maui Pineapple Flavored Rum, and Maui Okolehao, made from East Maui ti root. All Haleakala Distillers products are distilled on Maui from 100% Maui-grown natural ingredients. Click here to see the list of retailers in Hawaii OR here to see the retailers on the mainland or order through an online retailer. Which Maui Made Brew is your favorite? 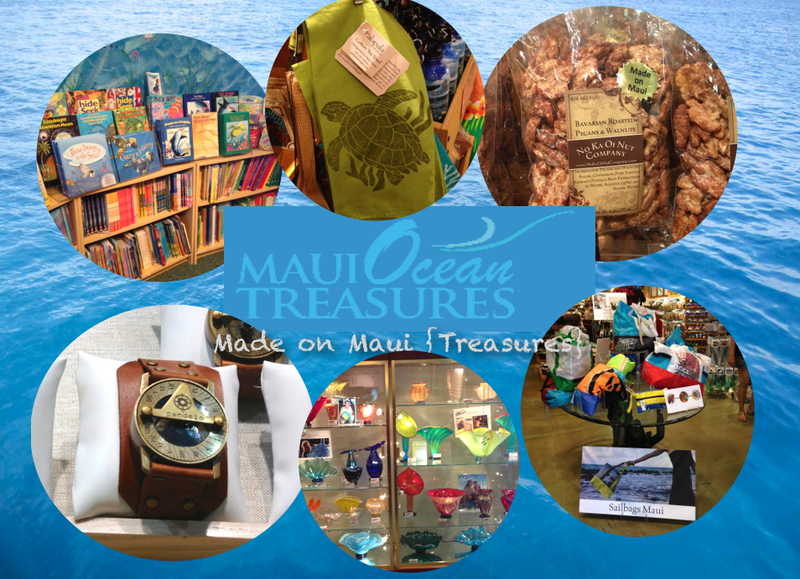 Maui Made Treasures at Maui Ocean Center Store! For the last ten years I have shopped at one store for just about every birthday, shower and Christmas gift that I have purchased. The gift shop at Maui Ocean Center (aquarium), now called Maui Ocean Treasures, is a 6,000 square foot store featuring an unbelievable assortment of ‘treasures’. There are the typical aquarium gifts: t-shirts, stuffed sharks, a wide assortment of logo-items, plus quality items that you would never expect in an attraction gift shop. There is fine jewelry, hand-blown glass, beautiful artwork, home and kitchen wares, and more. It would literally take hours to pursue all the sections at this store. I went today to get gifts for a baby shower, a baby luau (first birthday party, a big deal here in Hawaii), and a birthday/care package for my family on the East Coast (sorry everyone to ruin the surprise!). I also figured I’d take a few pictures of some of the made on Maui items. First, let me just say that if I had taken pictures of each made on Maui item my phone would have run out of memory. Second, I have to say that I go to the shop fairly often, and each time I am pleasantly surprised by all the new items. Third, the store has filled the void recently left on Maui in two different genres- It has a wide variety of books and music, including a great children’s book section, which is awesome since the only book store on the island is all the way in Lahaina. The shop also has a great children’s/toy section, and since there is (currently) no baby stores on the island, this is a great place to buy toys, books, and the ever important kids beachwear (including the hard-to-find reusable swim diaper)! A beautiful display of ‘Sailbags Maui’ bags at the entrance – made from recycled kite surf kites! NUTS! No Ka Oi Nut Company’s nuts look good enough to eat! Jams, Cookies, Coffees, Candies and more…. Made in Hawaii! Find the perfect gift for your pet and your pet sitter! Pottery, Plates, Perfect for Presents…. Books on fish, sharks, etc. Need a gift for a baby luau, baby shower, or kids birthday party? A wide selection of baby and children’s gifts and toys. Hard-to-find iplay hats, rash guards, sun suits and reusable swim diapers! Or get a child’s name hand-painted in fun, tropical letters! Hand-painted tropical letters by Mark! A perfect, one of a kind gift for any child! Pandeia Watches – Follow your Inner Compass with this Compass Sundial Watch! And if all that shopping makes you thirsty, don’t forget about the Roselani Ice Cream at the Reef Cafe, or the Maui Brewing Company beers at the Seascape Restaurant (all, of course, made on Maui). What gift would you get?